This book was really interesting, I had no idea all of these things happened in one summer and how huge and impact a lot these events had. 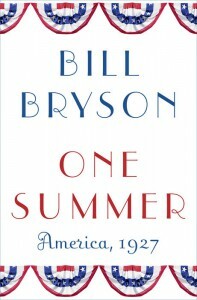 In covering the events of 1927, Bryson discusses events before and after 1927 that have a relevant impact on the story giving us a more complete view of the individuals who played such a large role in our social climate. While I appreciated a more complete view, I found the way this story was written to be a bit disjointed at times and slow. I think that some of the more in depth information wasn’t wrapped into the book well which added to the slow feeling (the section on Fordlandia comes to mind, it’s interesting but feels like it doesn’t belong in the book). I listened to this on audiobook in two sessions and I think if I had read this book in smaller chunks reading one person’s story then setting it down and coming back to it I think I would have enjoyed this more.